With ZipBooks, your customers can pay you easily, right from their invoice, with any major payment processor. We recommend syncing with Square as we have the deepest integration with them, allowing ZipBooks to work seamlessly with your account. However, if you or your customers are already using another payment method (like Stripe or PayPal), we offer powerful integration with them as well. Under Account, click on Payments. Decide which payment option you’d like to set up, and click on the Connect Now button. On the next screen, log in and allow ZipBooks to access your payment processing account. When you return to your ZipBooks account, it should show that you’ve successfully “Connected” to that payment processor (marked with a check). Now you’re set to accept payments through ZipBooks! Your payment processor account may take a few hours to sync with your books, so don’t fret. Payments processed through ZipBooks will be deposited in accordance with the standards set out by the payment processor. Note: If you are taking advantage of our free Starter plan, you can use Square or PayPal to accept payments in ZipBooks. 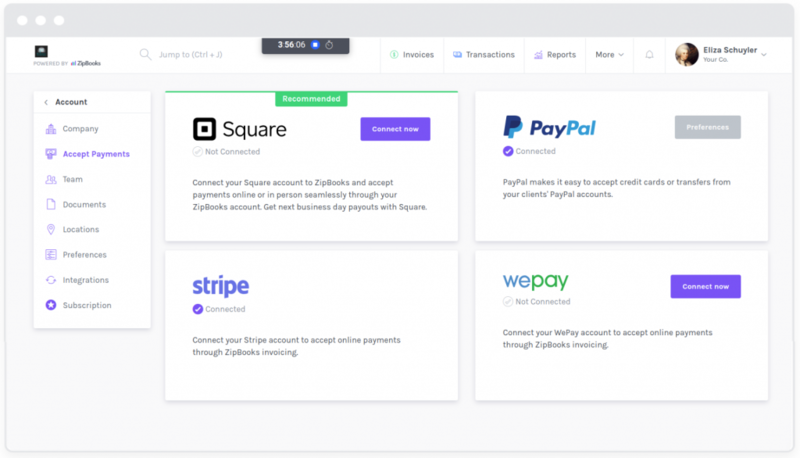 To integrate with Stripe or WePay, you’ll need to upgrade your subscription.